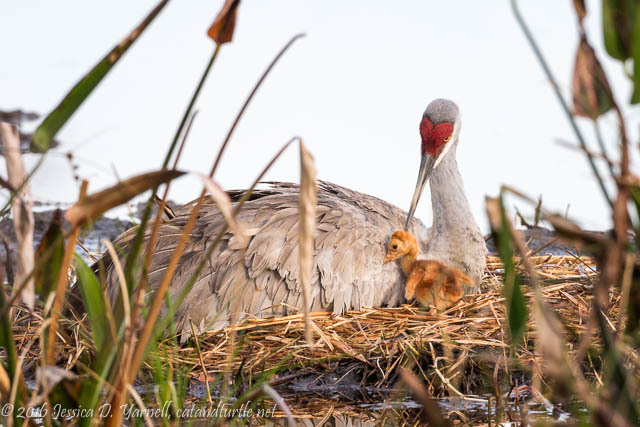 Blog > Beyond the Backyard > Sandhill Crane Nest > Carpe Camera! 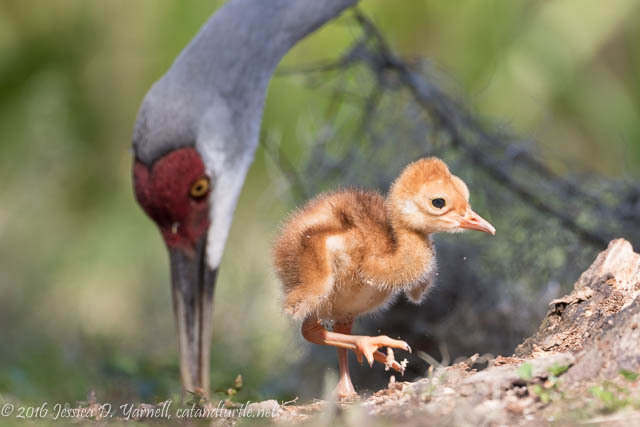 Day-Old Sandhill Crane Colt! Carpe Camera! 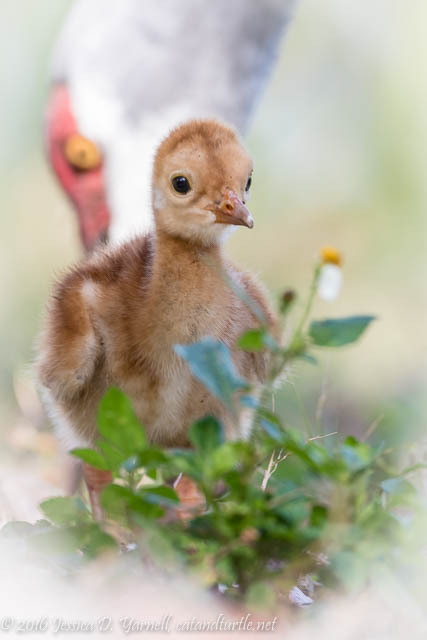 Day-Old Sandhill Crane Colt! Aw! I got to the nest about half an hour after sunrise on an overcast day. The light was terrible as I found a “window” through the reeds that let me see the nest. Then I watched and waited. Mom sat there patiently, preening herself, adjusting the grass of the nest, and generally killing time until the baby woke up. Rustlings of her back feathers were the only indication that she wasn’t just sitting on an egg. Then pop! Her tail feathers parted and out popped a little head. 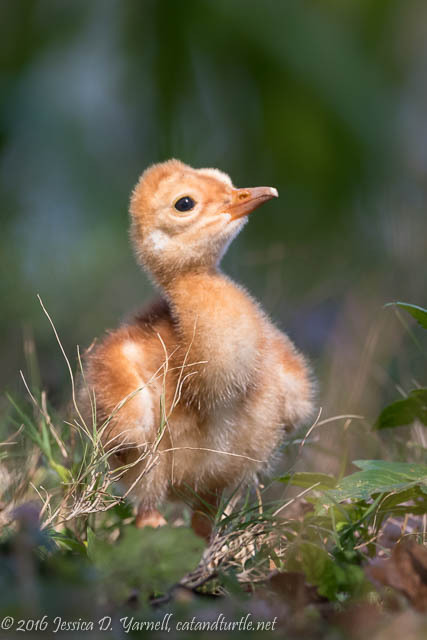 I got my first glimpse of Baby Uno as he stumbled out through her tail feathers and took a few staggering steps towards her face. After a tumble, he reached his mom’s back and tried to climb up, but he wasn’t steady enough on his legs. She reached over to nuzzle him and say good morning. Then he headed back under her wing. I dubbed him Baby Uno because I thought there might be a second egg. Mom still seemed to be incubating. But when the sunlight started to break through the clouds (a little), she stood up and revealed just one colt. Dad, who had been prowling nearby, walked over and together they started to feed Baby Uno. They left the nest unattended for long enough to tell me that Baby Dos wasn’t going to happen this year. … especially when Mom comes by to give you a little shove back towards the nest! This was the only little “hop-skip-jump!” that I observed on his first morning. Not bad for someone less than 24 hours old! I loved the reflections in the still water below him. After the little walk on the mud flat, Mom and Dad and Uno left the nest, probably for the very first time. The nest was about ten feet away from me, and a bunch of reeds separated the nest from the nice grassy area where I was sitting. 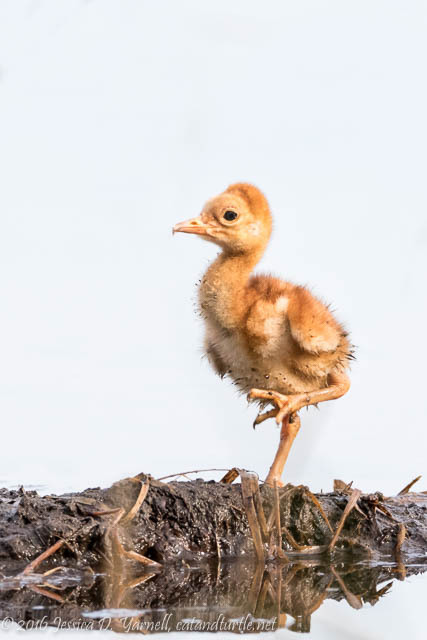 Mom and Dad can cover that small distance in a few steps, but they have the advantage of height, long legs, and lots of practice walking. Baby Uno took about an hour and a half to plow his way through the vegetation and swim through the watery parts. He finally put his wobbly feet on dry land as the sun finally came out. “I’m Cute!” he seemed to say as he stood tall and proud in the grass. He looked hopefully up at Mom. He knew it was breakfast time! His cousins, previous hatchlings from this particular nest, were usually covered in grass seeds by the time they made it to the camera. Uno looks equally cute with his feathers all fluffy and seedless! 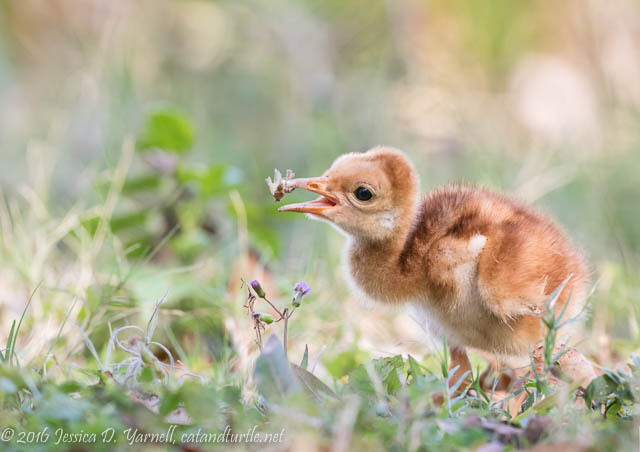 Sandhill Cranes eat a variety of worms, grubs, etc. 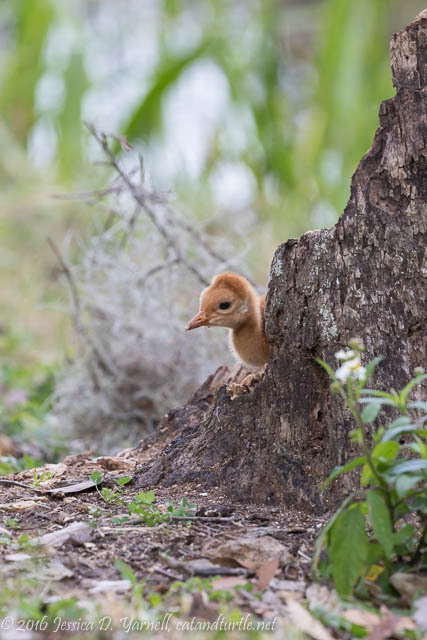 With those big beaks, they can pluck a bunch of goodies out of the ground to eat. So it’s always interesting to see these large adults with their big beaks picking out the tiniest worms and things for their babies. Often Mom and Dad both hover nearby, each with a food offering, encouraging the baby to hurry up and eat. It’s no wonder that the babies grow so fast! How Do I Swallow This? 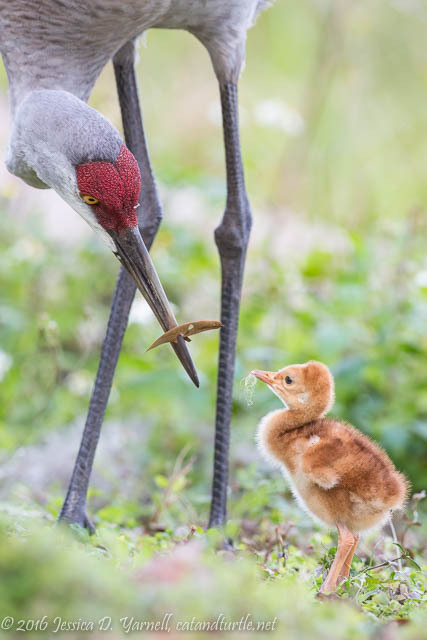 Here Mom handed little Uno a worm that wrapped itself around the baby’s beak. It took the little guy a few tries to work this one down! 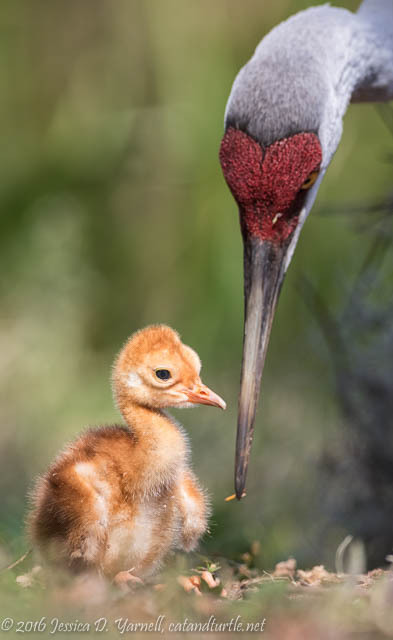 Photographing Sandhill Crane colts in the first week is such fun because the feeding are frequent, and the baby drops each morsel two or three times, so the photo ops are plenty. Give him a few weeks, and Uno will be finding his own grub, and swallowing it faster than my camera can shoot! Even though he’ll be capable of feeding himself, the parents continue to feed the baby for several months. They stick together for a full year, until it’s time to build the next nest. Just one day out of the egg, the parents were very protective of little Uno, and they hovered over him constantly tending to him. The adults do this neat little purring sound to communicate with each other and with the baby, and the baby too has this little peeping cry. It’s really sweet. The baby didn’t seem to mind all the attention, but he was old enough to start exploring on his own a little bit, too. He found this old tree stump and found he could crawl back into it. He did so repeatedly, seeming to play Hide and Seek with his parents. Or maybe it was Peek a Boo! With such a cute baby around, it’s easy to ignore the adults, who are beautiful in their own way. 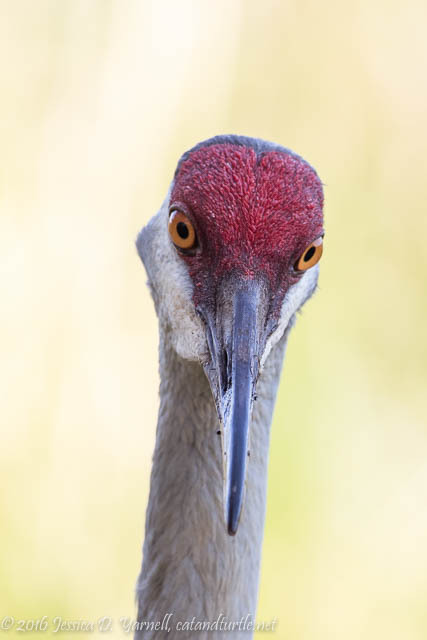 I love doing head shots of Sandhill Cranes. Especially when they look straight down the lens barrel! 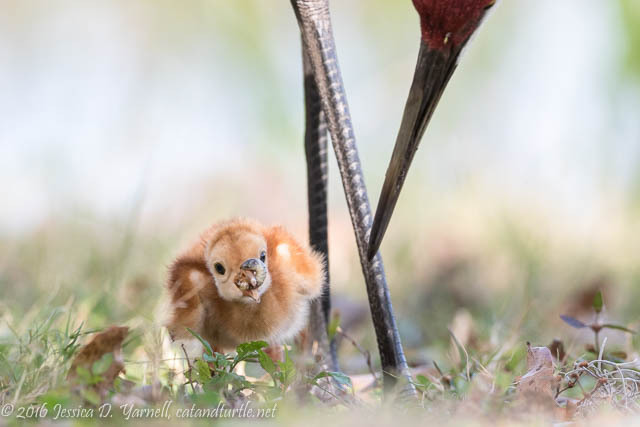 Sandhill Crane colts are so tiny, and yet I always have to chuckle when I see the size of their feet. Here Uno is heading back to his tree stump as Dad watches protectively from behind. Look at that big foot of his! He needs to trim his nails. At just one day old, little baby Uno here has already learned a very important life lesson: always take time to smell the flowers! I plan to take his advice as this beautiful Florida spring weather entices me outside with a camera. So you know there’ll be a new post soon – and of course that includes more on Baby Uno! Wow, these photos had me smiling all through this post. Beautiful photography! Great series, Jess! 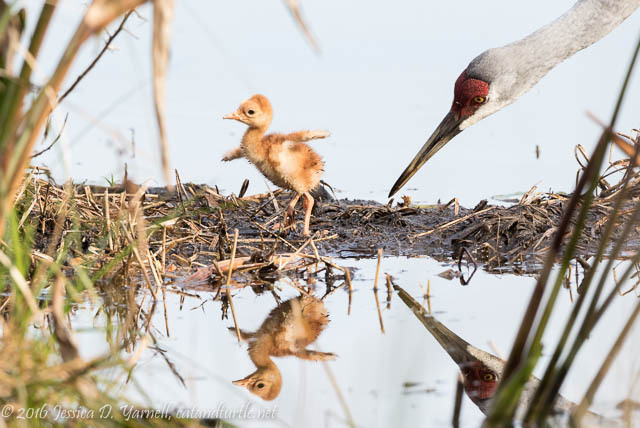 I love the reflection and the one with the adult behind and flowers in front of Baby Uno.